During our two years in Texas, the bumper sticker pictured above was one of the many sort of ‘stereotypical’ images we saw stuck on car bumpers or blown-up in large print along the highway. These were little reminders that Texas was a very different sort of place than the Southern California we had grown up in. In current retrospect, this is as equally true now that we’ve lived in Scotland for almost half a decade. Seeing similar images recently also reminded me of a long-forgotten story. Years ago, when I was still in my undergrad days, I took a course taught by the Chaplain of the University I was attending who despised bumper stickers like this. They were not, as he would argue, just poorly worded propaganda, they were pragmatically one-sided as well. Quite appropriately, he referred to the statements made on them as ‘bumper sticker arguments,’ opinions or beliefs tightened up into a few words for the sole purpose of making a proclamation about the person who fastened them. These were not the sort of affirmations one makes in the company of colleagues or respected rivals. These were not arguments made with intellectual debate in mind. Rather, as he would tell us, these were the sorts of arguments that come from individuals who’s minds are already made up. People who attach these things to their cars were announcing something. These were the sorts of people who did not want to debate or discuss the content of the sticker, but would rather you know, simplistically, that this is what they believe. Looking back, I would argue that this is only slightly true, mostly because while I agree that these sorts of statements do in fact represent the opinion of the individual who attaches them to their vehicle, I also believe they harbour a narrative quality as well. That is, not only are they a summarised position, a guide-post signifying for the reader what the attacher believes about something, they are equally a way to isolate for that latter person a conceptual part of their identity. In recent months, and in a similar manner, there has been a great deal of discussion and debate about one of the films nominated for Best Picture at this year’s Academy Awards. Specifically, it seems the discussion has been about the validity, or even ‘truth,’ behind the story of Chris Kyle’s experiences in Iraq and the United States between 2003 and 2013. 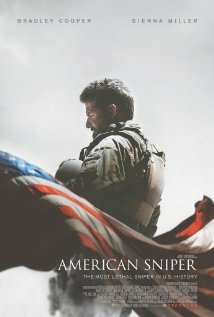 American Sniper tells the story of Kyle’s four tours in Iraq, touching briefly on his life leading up to his first deployment, his relationship with his wife, Taya, the reputation he gains as the most ‘lethal sniper in US history (160 confirmed kills out of 255 probable), as well as the hardships he suffers during his time in combat, and the emotional scars left after returning home. It concludes, with a somber and subdued tone, with images of his memorial at Cowboy’s Stadium in Dallas, Texas. Based on an autobiography that Kyle co-authored with Scott McEwen and Jim DeFelice, the film depicts him as a haunted, yet determined ‘American patriot,’ portrayed quite remarkably by Bradley Cooper, who has equally been nominated for the Best Actor Oscar. Directed by Clint Eastwood, the film takes a number of liberties from Kyle’s story so as to create a narrative not only told in distinct parts, but that clearly determines a dichotomy between protagonist and antagonist. In the latter, a character called ‘Mustafa’ is entirely conjured in order to depict Kyle’s mirrored counterpart; an equally lethal sniper that haunts (and hunts) Kyle throughout his time in Iraq. Kyle shot and killed two men attempting to steal his truck in 2009 and was excused of all charges (a police report was not even filed) because of an intervention by the Department of Defence. Kyle shot and killed ‘at least 30’ armed looters from the top of the Super Dome in New Orleans shortly after Hurricane Katrina. After a verbal altercation in a bar in San Diego, Kyle punched and ‘knocked out’ former Minnesotta Governor, and fellow Navy Seal, Jesse Ventura. For more detail on these stories, see the article on Kyle on Snopes.com, and the well-written piece for the New Yorker, “In the Crosshairs,” by Nicholas Schmidle. Or, at this point, and thanks to the film’s popularity, simply google Kyle’s name. Something will come up. While this controversy is indeed something worth discussing, and while Kyle’s life is indeed an interesting story, it is not the focus of this post. Rather, my intentions herein are about the narrative of Kyle’s story, and how we so easily seem to shift these sorts of stories into concepts, overlooking, or even pragmatically ignoring, facts for the sake of legend. Kyle’s story, or at least the one re-imagined in Eastwood’s film, works as a narrative concept for individuals on both sides of the discussion. On one end, he depicts a national hero, a patriot who willingly gave his life for his country, protected his fellow troops, defeated the enemy at all costs, and who died trying to assist his fellow soldiers suffering from the physical and emotional scars left by the tragedy of war. On the other, he is an example of violence begetting violence, a man obsessed with proving his masculinity, who equally depicts the religious zealotry exemplified by the war in Iraq. But again, I would argue that separating his character into these two depictions once again overlooks the fact that his story is merely a narrative interpretation, one narrative interpretation, of a single point in history. Whether it is true or false, it is a narrative, a story built with and from discourse. Even when mythologized, even when we find ourselves leaning in either direction between promotion and criticism, his story is just a story. His narrative is just a narrative. It is, in each of these interpretations, a conceptual representation, both bumper-stickered and debatable. What we see and do in war, the cruelty, is unbelievable. But somehow we gotta make some sense of it. To do that, we need an easy-to-understand truth. And damn few words. 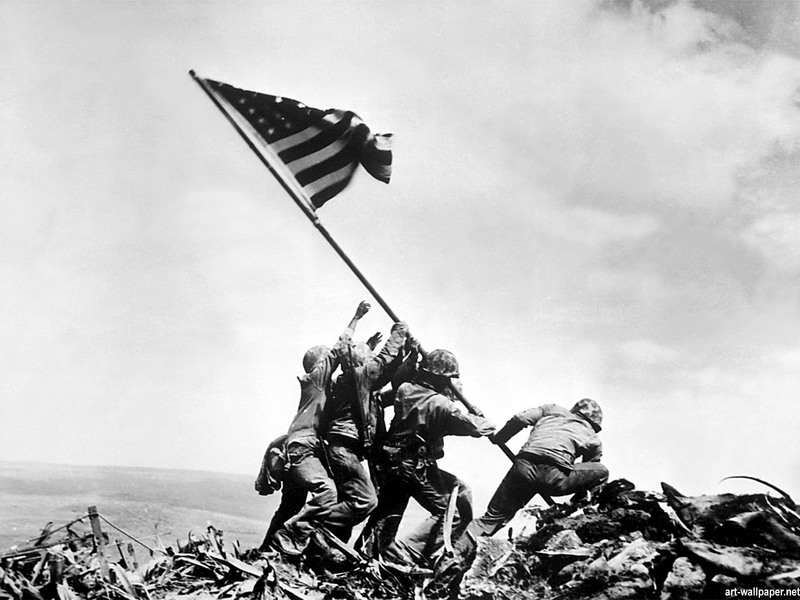 And if you can get a picture … now, the right picture can win or lose a war. Whether or not there is any sort of truth to the myth, whether the facts depict a truth that we might quantify in any sort of ‘real’ sense, we need narratives. Even if they present material that for some of us is outrageously fictional, narratives are just as essential to the individuals who use them to define themselves, as they are for us in our own means of self-definition via the ways we interpret them. In this way, when we see ‘bumper sticker arguments,’ perhaps the better response is not an immediate reaction, such as the Chaplain above seemed to have promoted. Rather, when we see these sorts of images, perhaps we might be better off simply understanding that they represent a narrative, a means with which certain individuals define themselves, either for or against the statements made. Whether we want to simply believe them as true, research the facts within, or work to disprove them, they will always be stories. 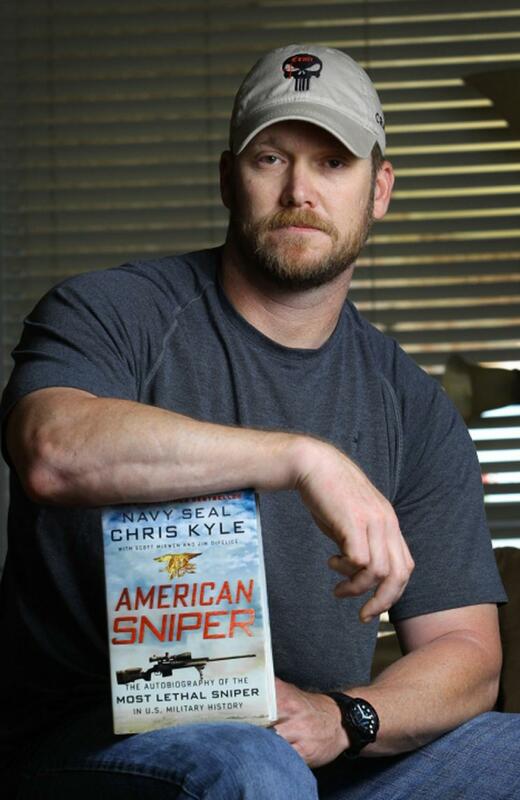 After all, Chris Kyle now lives solely in legend, but only because he now exists solely as a character within a story; a fate that awaits us all in time. For pragmatic reasons, then, the stories others tell, the stories we tell about them, and the stories we tell of ourselves, work as identifiers, assisting us in making sense of life in our determined search for meaningful fictions.